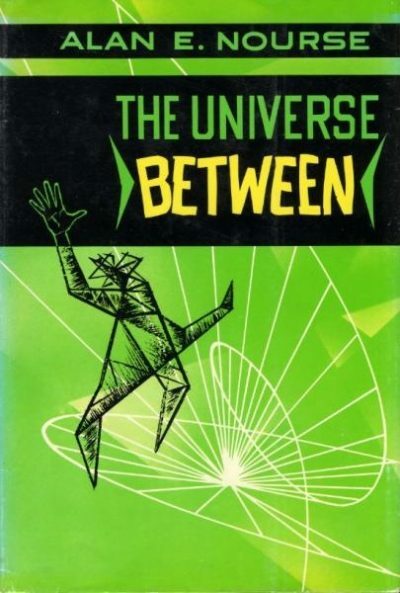 Alan E. Nourse’s 1965 The Universe Between is a fix-up of two novelettes published in 1951: High Threshold and The Universe Between. Ambitious cryogenics research has created an incomprehensible thing in the middle of the lab. Attempts to understand it have killed three men and put two more in the madhouse. Determined to unravel the mystery, Dr. John McEvoy has turned to the Hoffman Center. Perhaps the Center can provide a volunteer resilient enough to survive the thing (which may be a hypercube). Much to McEvoy’s surprise, the best man for the job is a girl. Gail Talbot is a survivor. Others might have been broken by her miserable experiences; Gail has learned to adapt and survive. She finds the realm beyond the hypercube too much for even her remarkable mind to understand—but she does manage to survive and return to her home world with a bold plan to explore the universe next door. Alas for McEvoy, not only will her plan take years to be realized but an essential part of it involves ending McEvoy’s efforts to understand the cube. Worse for McEvoy, Gail’s time on the other side of the Threshold gave her the tools she needs. A generation later, McEvoy has nearly forgotten the incident with the hypercube. Humanity’s demand for raw materials to feed the ever-expanding economy has stripped Earth nearly bare. Conventional rockets are too expensive; only teleportation offers humanity access to the extraterrestrial resources it needs. Success comes with a price: McEvoy’s half finished apparatus may make objects vanish in one place and appear—somehow—in another but since he and his fellow scientists have no idea how it is doing this, they cannot reproduce the effect. Worse, the machine’s activities are upsetting someone in a universe not too far from McEvoy’s. Desperate to turn the machine off, unable to tell exactly where it is, the extradimensionals lash out blindly, sending slice after slice of Earth into oblivion. Gail Talbot, now Gail Benedict, has bequeathed interdimensional exploration to her son Robert. Raised from infancy in both our world and the four-dimensional one next door, Robert can function in both, at least to a degree. He’s never managed to understand the entities on the other side or make himself understood. Now, if humanity is to survive, he must succeed in communicating. Bob Benedict is one of the few scientists able to make contact with the invisible, dangerous world of The Thresholders and return – sane! For years he has tried to transport – and receive – matter by transmitting it through the mysterious, parallel Threshold. At first his efforts met only with failure and madness. But now The Thresholders have risen in fury. Somehow Bob Benedict must make one more trip into that land of peril and pacify them before they succeed in hurling his planet – piece by piece – into the oblivion of infinity. My guess is whoever wrote this blurb never read the actual book. Having set up a situation where communication is nearly impossible, Nourse cheats a bit by tossing in a bit of telepathy. He may have been playing to his editor, John W. Campbell, who was inordinately enthralled by psionics and other nonsense. It occurred to me that the way the teleportation device works (even though unfinished) might be a reference to the infamous Hieronymous Machine but the timing does not work: Nourse’s novel predates Campbell’s editorials promoting Thomas Galen Hieronymus’s device by five years. I am struck by how essentially unlikeable McEvoy is and how consistently he leaves a trail of carnage and destruction behind him. His experiments with the hypercube kill three men. The incident with the teleporter costs the US sections of Manhattan and Philadelphia, not to mention the forty-mile-deep hole  next to Lake Erie (not to mention whatever was happening on the other side of the Threshold ). He would be an ugly protagonist. But he’s not the protagonist, just the force that kickstarts the plot. Not that Astounding wasn’t given to protagonists who appear villains to our eyes. I was a bit disappointed that Gail is replaced as protagonist by her son Robert, but at least she is an active participant in the plot: Robert was her means to explore the world on the other side of the threshold. I note that there is another woman of significance in the book, not something I would expect from Nourse. the focus is always on McEvoy, Gail, Robert. and the Hoffman center. Nourse also ignores alternatives to stripping other worlds of resources. Conservation? Recycling? No room for anything that does not move the story Nourse wants to tell forward. The book focuses narrowly on one lab and one technology, teleportation, then spins enough plot to fill several volumes, crammed into one tiny book. It’s not great literature but I loved it as a teenager. The Universe Between is available here. 1: I suspect “forty miles” has to be hyperbole because they don’t mention the giant steam explosions that would follow once Lake Erie drains into it.